SuperKids Software Review of Math Blaster Algebra. Math Blaster Algebra begins with an animated video clip detailing the collision between an asteroid and the space ship ‘Nomial’. The accident leaves the ship defenseless prey to a group of destructive aliens, the 'Quadraticas'. The user is asked to come aboard and help repair the damaged areas in the ship by completing five activities at three difficulty levels (covering a full year of Algebra 1). Activities cover more than 25 topics including algebraic expressions, graphing lines and parabolas, factoring polynomials, and solving quadratic equations. They take the user from the ship’s Control Room to various other sections of the ship, each section featuring a different activity. A robot friend and guide, ‘Skully,’ is available in every room of the ship to provide the user with information and handy tips. The 'Strategy Room' on the ship provides brief tutorials on each of the topics required by the activities. Each tutorial is available in both video chalkboard format, and plain text. "I really appreciated the chalkboard presentations," noted one father. "The program clearly illustrated where numbers came from, and how to solve problems." The tutorials are supported by practice problems, and word problems. Several of our reviewers noted, however, that they wished the Strategy Room was more closely integrated with the activities, to provide more focused educational support. 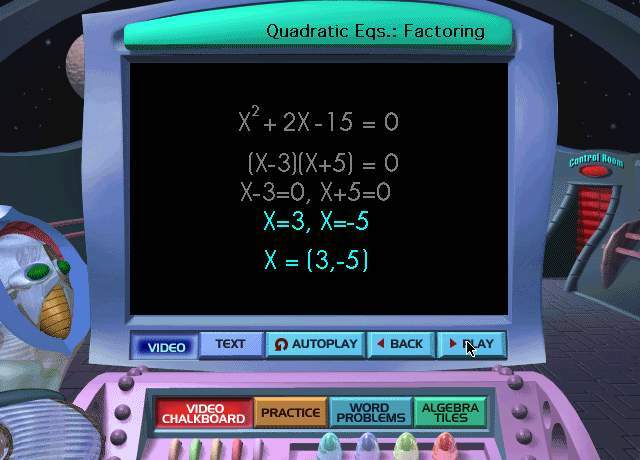 Math Blaster Algebra provides a personalized progress report card for each user, noting the number of problems attempted in each topic area, and the users success rate. SuperKids' student reviewers were intrigued by the activities featured in Math Blaster Algebra. They enjoyed utilizing the problem-solving skills involved and felt interested and challenged by the program’s various games. Math Blaster Algebra includes everything from quick-thinking and reaction-challenging arcade-like games, to thought provoking rebus puzzles, making it broadly appealing. The space-theme, while a bit cutesy at times, is not so overdone as to seem excessively juvenile. Reviewers did, however, mention feeling a bit deserted and left without adequate guidance upon approaching each activity. Skully’s descriptions did not sufficiently outline the undertakings at hand, nor did the brief User’s Manual included in the CD ROM case. Consulting "Math Blaster Algebra Help" from the Help menu in each activity provided additional and more detailed explanations, but users still expressed frustration with specific activities and topics. Sample questions and solutions, or a link to the appropriate instructional section in the Strategy Room would have been greatly appreciated. Math Blaster Algebra is appropriate for students looking for an introduction to algebra, as well as those seeking to become more proficient. Several parents also noted that they found that the video chalkboard provided them with a valuable refresher, enabling the parents to better help their children with algebra homework. Students struggling with algebra, however, may find the program lacks enough depth of structured instruction to be of major help.